Inhabitat has a post on the latest iteration of the Oyster wave power generator - New Oyster 2 Wave Power Generator Unveiled This Morning. Basically it works like this. The Oyster 2 is anchored to the seafloor about half a mile off shore. Near-shore waves pound against its frame and engage the hinge mechanism. The hinges engage two hydraulic pistons that are connected to hydroelectric plants onshore. Essentially the Oyster turns offshore wave power into onshore water power. The first prototype Oyster 1 was installed and tested in the summer of 2009 and Aquamarine Power used information from that test to vastly improve their design. The Oyster 2 is simpler in design, has fewer moving parts, generates 250% more electricity and is easier to maintain. A lot of issues developing in the offshore wave power industry have to do with the cost of installation versus the amount of energy extracted. It seems that the Oyster design solves this problem by replacing conventional turbines with hydraulic pistons to create the energy onshore instead of out in the waves. 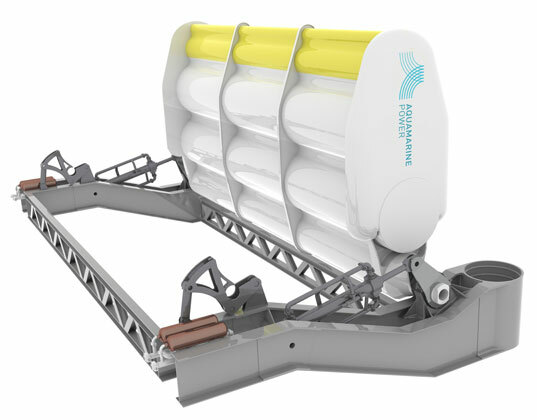 Three Oyster 2s will be deployed and connected to the grid in the summer of 2011 at the European Marine Energy Centre in Scotland. These Oyster 2 farms sound like a productive — and adorable — addition to the renewable energy market.